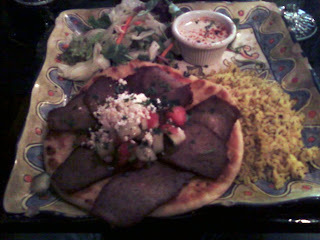 Gyros are not exactly a difficult food to find in Boise. There are of course Mediterranean restaurants, but there are also drive-through shacks, sports bars and at least one burger joint that have them on the menu. A while back I went on a bit of a gyro kick, writing up several of the available options, but due to how infrequent my trips downtown are I didn't get around to trying one of the most obvious and enduring places. A few days ago, my roommate's mother showed up unexpectedly and took the kids swimming, leaving us a free evening to grab a meal without worrying about money or children's palates. The roommate had been craving Mazzah, and though I love them dearly I was hoping for a place I could review since I've been slacking off a bit on that lately. 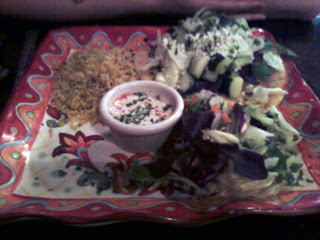 A really good coupon helped me push a compromise, and off to Cazba we went. Neither of us had ever been to Cazba, and as such it took us a little effort to locate it. We actually walked right past it and I ended up standing just a couple of doors down from it while I called and asked them for directions. Though patio dining sounded nice, it was a bit crowded so we opted to dine inside. There was no sign indicating whether we should seat ourselves or wait for someone else to do it. My companion asked a couple at a table near the door, who advised us to wait to be seated. A waitress appeared shortly and took us to a table near the middle of the restaurant. The decor was a little garish but pleasant if you're into that sort of thing, and a row of televisions mounted above the well-stocked bar displayed various sporting events and informational programs. The sound, however, came from bad techno/dance music being played over the speaker system. A little irritating, but I've heard much worse. After being seated, we each ordered a Mountain Dew (we like to support places that carry it, down with the Coca-Cola monopoly!) and perused the menu even though we both knew pretty much exactly what we were going to get. The roommate, after all, was having a major falafel jones (which is why she wanted to go to Mazzah in the first place). I was pretty firmly set on the gyro platter, though I was nearly dissuaded by the Pastitsio, a Greek dish described as "pasta layered with ground lamb, bechamel sauce, a mixture of cheese and spices. Topped with Cazba's special tomato basil sauce." In the end, I decided to stick with the original plan. 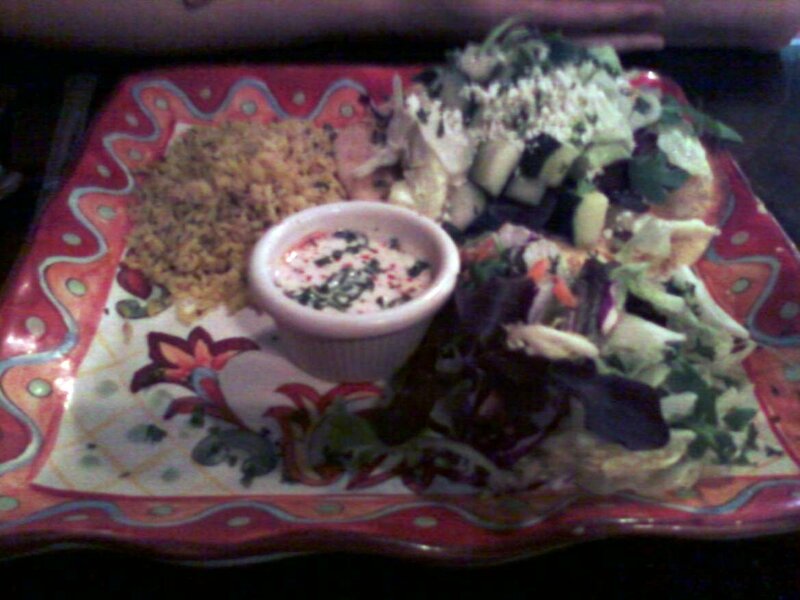 We skipped the appetizers, keeping in mind how generous the portions at Mazzah are. When our food arrived (incredibly fast, so quickly that we both questioned how fresh it could be), I whipped out the camera only to find it was completely dead. This left me with only my crappy camera phone (though it would have helped if I had known there was a "night shot" option at the time). The roommate said the falafel was good, but not as hot as she would have expected. The bread was a garlic herb pita, also a little different than you get from most of the places around here, prompting her to say she missed the "pillowy goodness" of Mazzah's pitas. She tried to fold her food up into a sandwich and the wrap started to tear, eventually forcing her to employ her fork. I had a little better luck with my food, being as I am a veteran of many years experience eating gyros. I was able to pile all of the side vegetation into the wrap and eat the entire thing as a sandwich. It was perfectly good, but didn't really stand out from most of the other ones I've had around here other than being a little larger and having the aforementioned slightly different bread. Plus, being given only one side makes the the prices seem a bit high. 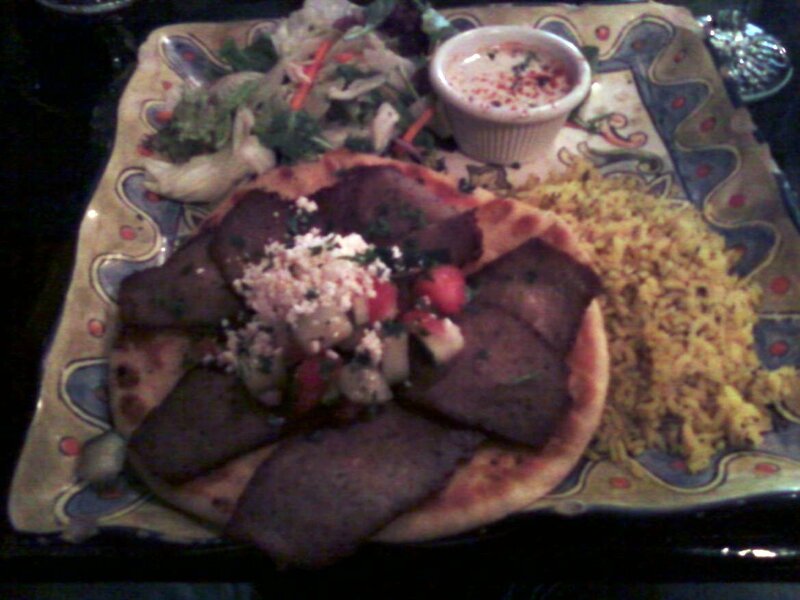 The gyro platter at Mazzah, for example, comes not only with the sandwich but basmati rice with more strips of gyro meat on top, and an additional two sides of your choosing for roughly the same price. Plus, each time we've been there the food has always been hot and come across as very fresh. Both of us chose the rice pilaf for our side, and while we agreed it was just okay I ate pretty much all of mine while trying to determine a familiar seasoning I just couldn't quite make out. Interestingly enough, we also both agreed that the stand-out thing in both meals was the tzatziki sauce, which was a more diversely seasoned variety than I've ever had. We also agreed that it couldn't completely replace the classic variety. In the end, Cazba definitely has some things going for it. 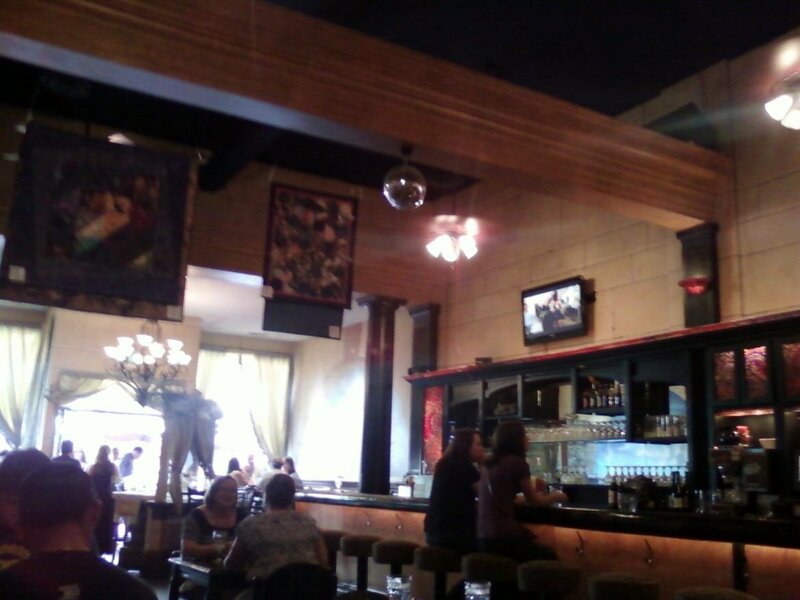 Great staff, lots of atmosphere, and good food with unique flavors. However, there are other places to get that style of cuisine, and I'm willing to trade a little atmosphere for generous portions of delicious food that is closer to home and where I don't have to pay to park. 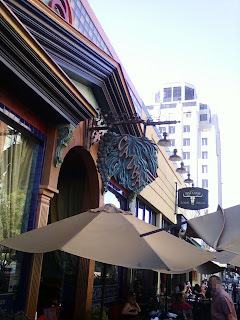 Still, being THE downtown Mediterranean spot, they're definitely worth checking out if you're in the area. I might even have to return for that pasta dish myself. Edit: The roommate feels my comments on the parking situation were misleading and might steer some people away from eating downtown. So just for anybody who wasn't already aware, street parking is free downtown on weekends and after six o'clock P.M. in the evening on weekdays, if you can find an open spot. A lot of the garages are also free for this first hour, which is great if you don't intend to order an appetizer and/or dessert or linger over your drinks. I don't know if Cazba validates parking.